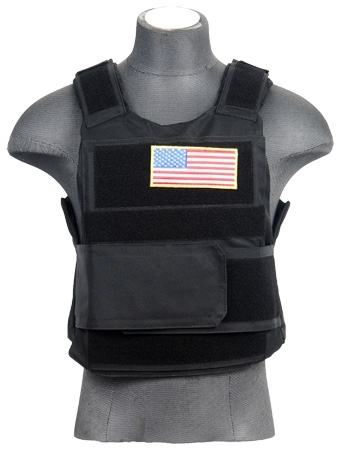 The Lancer Lancer Tactical CA-302 Body Armor Vest comes in Black and is complete with 2 Mock Ballistic Style Plates and a United States Flag patch. 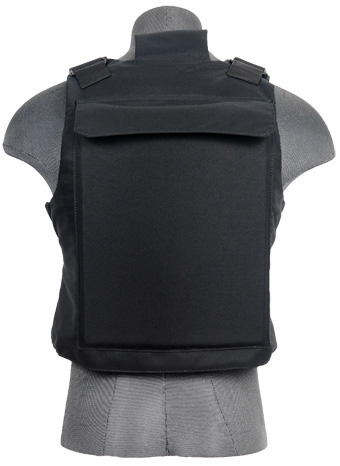 Worn by essential personnel or VIP's during high risk situations, these vests provide adequate protection while being lighter than assault plate carriers. Adjustable to fit most users through a series of Velcro panels and padded shoulder straps that can be wrapped snugly around the wearer. It's made with 600 Denier polyester materials to last you in the heat of battle whether you're running, gunning, or under fire. 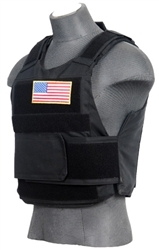 Large Velcro panels make up the front section and shoulder straps to attach additional patches or identifiers. Includes mock ballistic plates that can be slipped into the compartments found in the rear and back panels that can be accessed through Velcro flaps found on the bottom of the vest. These plates are styled after modern ballistic plates however WILL NOT provide ANY protection against ballistics whatsoever. They will provide structure to your vest and nearly eliminate the sting of BB hits though however making these a perfect set for airsofters.